Holidaymakers were warned to expect further flight disruption at Frankfurt Airport, even after striking workers ended their action early. Passengers were advised to check their travel insurance cover if they were affected by the strike after cancellations continued into Thursday. Members of the GDF union had been due to strike until 11pm on Friday, but ended their action on Wednesday after airport owner Fraport agreed to reopen talks in an ongoing pay dispute. 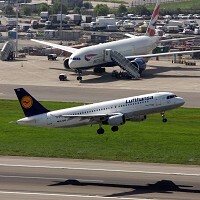 Lufthansa said: "Lufthansa welcomes that the air traffic controllers' union has ended their strike action at Frankfurt Airport. Lufthansa will do everything to return back to normal flight operations." Fraport CEO Dr Stefan Schulte said: "In the interests of the passengers, airlines and our airport staff, we welcome the resumption of talks to seek new solutions at the negotiating table."